Greetings, Reedies. As your alumni association president in the association’s centennial year, I have the honor of serving our far-flung community with the assistance of a fine leadership team and several dedicated board members and chapter leaders. All volunteers, we collectively direct the alumni association’s goals, programs, and services, and do our best to represent the alumni in the broader Reed College community. Our primary mission, however, is simply to increase alumni engagement through a variety of local, regional and national programs designed to create a sustained connection with the college. Our primary thrust this year will be to further develop career-based alumni connections, particularly for current students and recent graduates. In our 100th year of existence, we feel it’s time we focused our collective efforts on creating a strong alumni career network beyond the traditional academic ties that have been the hallmark of the Reed community. The alumni board has been structured to address this, adding to the subcommittees for Reunions and outreach the committee Life Beyond Reed. This group will have a leadership role in developing alumni career connections through programs with college staff such as Working Weekend each February, career development networks utilizing online, Reed-specific community tools such as Switchboard, and maven networks for specific career fields. I encourage you to connect with your fellow Reedies through any one of a number of means in your area, whether it be a Thirsty Third Thursday or the annual Reunions on campus. We have also developed an online book group and a vibrant presence on social media. Finally, should you feel moved to help our community, please consider volunteering either locally or through the alumni board. We are always looking for skilled and hard-working talent. Thank you for the honor to serve as your association president this year. I look forward to seeing many of you on campus at Reunions in June. Are Reedies really special? 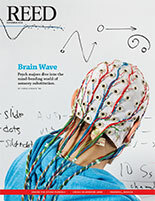 What’s the best way to advocate for Reed? How can we strengthen the Reed tribe? These and other topics formed the agenda for Reed’s Leadership Summit (formerly known as Volunteer Weekend), which was held in September. Scores of alumni and friends descended on campus to share their insights on subjects such as strategic planning, career networking, and fundraising. The weekend kicked off with a colloquium on the value of a liberal arts education led by Seth Paskin ’90 (producer of the podcast The Partially Examined Life), Gloria Johnson ’79, and professors Libby Drumm [Spanish 1995–], Troy Cross [philosophy 2010–], and Mary James, dean for institutional diversity and A.A. Knowlton Professor of Physics [1988–]. Advocates split into working groups to figure out ways of tackling various challenges facing the college, including Reed’s relationship with the Portland community; how to improve opportunities for research and independent study for students; how to create more opportunities for alumni and parents to connect with one another; and how to encourage more young alumni to support the Annual Fund. Alumni also discovered just how tricky it can be to find the right words to communicate what Reed’s all about at a talk by Mandy Heaton, executive director of communications and public affairs. Another popular event took place off campus at the New Deal Distillery in southeast Portland, where young alumni gathered for a lively fundraising happy hour. Prof. Jay Dickson [English 1996–] “electrified the room with ancient tales,” and alumni caught up with old friends while enjoying the spirits of Tom Burkleaux ’92, reports Breesa Culver ’01, assistant director of the Annual Fund. 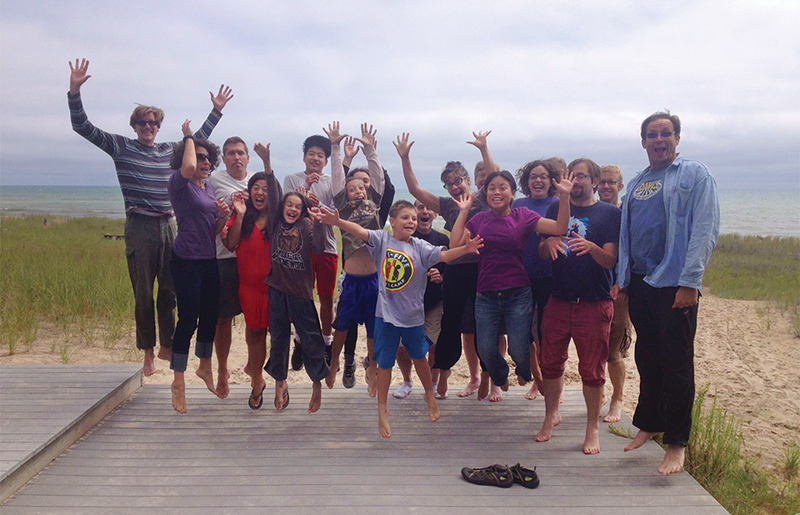 Westwind gathers in Oregon and—what?—Lake Michigan?! MidWestwind happened on the shore of Lake Michigan in August. Photo by Mike Teskey. 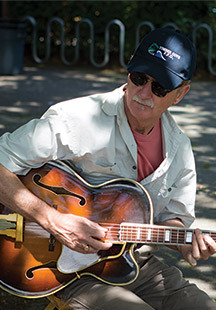 Celebrating a long-standing tradition that began in the early ’60s, Reedies gathered for a weekend in October at Camp Westwind, a spectacular retreat on the Oregon Coast. Westwind has now inspired a similar gathering in the midwest, known as MidWestwind, which was hosted by Alison Birkmeyer Aske ’93 and her husband, Fred, and son, Julian, on the shore of Lake Michigan in August. David Perry ’73 and Mike Teskey report that it was a great weekend; here are some updates from those who attended. Alison directed a staged reading of “If I Were You” and Other Elvis Presley Songs at the Greenhouse Theater in Chicago and Paul Miller ’02 had a role in the play. Clay Press ’81 enjoyed beach time with his wife and their three boys, who attend public schools Chicago. Cindy Joe ’08 is still working at Fermilab. She was at the U.S. Particle Accelerator School in Albuquerque, New Mexico, in June, and is back now from her first trip to London. Gareth Gollrad ’87, who is is alive and well and practicing law in Chicago, had fun kayaking and fishing on the lake. 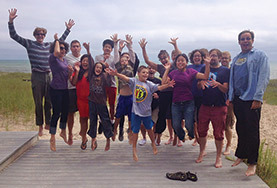 Sarah Wadsworth ’86 spent a sunny day on the beach with her family. She attended the Sixth International Conference of the Henry James Society in Aberdeen, Scotland, is still teaching at Marquette, and has recently published articles on Emily Dickinson and on Kenneth Grahame’s Wind in the Willows. Chris Unseth ’92 and his wife, Christiane, enjoyed meeting and talking with Reedies. Sara Frank ’96 is still working independently and has taken up writing fiction after a long break. Tracy Steindel Ickes ’06 took a break from practicing law to enjoy the weekend with her new husband (and her fellow Reedies). Megan Geigner MALS ’08 came with her husband, Joel Hobson, and recently took a course in Cologne, visiting Rome on the way. 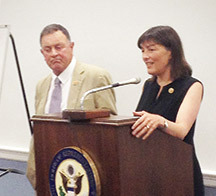 Richard Hanna ’76 and Suzan DelBene ’83 both serve in the House of Representatives. Some 65 alumni and friends were treated to an unusual display of bipartisan camaraderie in September, when two members of Congress—both Reedies—shared an inside perspective on government service and politics in the nation’s capital. Republican Richard Hanna ’76 (R-NY) is a lifelong union member who tends to his organic farm in upstate New York when Congress is not in session. He serves on the transportation and infrastructure committees. Democrat Suzan DelBene ’83 (D-WA) is a former Microsoft executive who serves on the agriculture and judiciary committees. The legislators took turns at the lectern to share their respective paths to the House and reflect on the demands, frustrations, and political realities that they face in carrying out their duties.